Bushfires are a natural part of life in some Australian states, however, it doesn’t necessarily mean danger and destruction are inevitable. Visit the Australian Government Bureau of Meteorology website to find out the fire-danger rating in your state/territory. Assess which parts of your property are most at risk from bushfires and come up with ways to reduce those risks. In particular, take a note of any vegetation, woodpiles, decks, etc. that could catch alight if struck by airborne embers. Find out whether your local government has any specific fire-break requirements and make sure your property complies with them. Know how to contact emergency services, and what to do if your water or power supply is cut off or you lose your landline or mobile phone connection. Keep emergency supplies on hand such as water, food, blankets, medicine, first-aid supplies, a battery-powered radio and anything else you might need. Have long hoses or a sprinkler system on standby. For small fires, a quick spray with the garden hose may be enough to keep things from getting out of hand. For larger fires, activate your sprinkler system and allow it to run for the duration of the emergency. The added moisture may stop spot fires breaking out on your property. Trim back any trees or other living vegetation, so that none are closer than two meters from your home. Keep roof gutters and valleys clean of fallen leaves and other debris. If possible, landscape your property so that it features regular fuel breaks: wide paths, paved driveways, ponds, etc. This will help slow a fire’s advance towards your home. Store flammable chemicals securely away from your home. Install a ‘heat shield’, such as a solid fence, around your property to help block on-coming heat and stop flammable objects igniting. Discuss bushfire safety with your loved ones, and design a plan that everyone can memorise and follow when bushfires threaten. When you and your family should evacuate and where to meet in the event any family member gets separated during the emergency. What precautions each member of the family should take and/or training they should undergo. What responsibilities each person will have during a ‘stay and defend’ scenario. What specific valuables, supplies, and pets should be brought along during an evacuation, and who should be responsible for each item. How to do basic first aid. Leave when you have to. As difficult as it is to leave behind your property and your possessions, the most important thing is you and your family’s the safety. 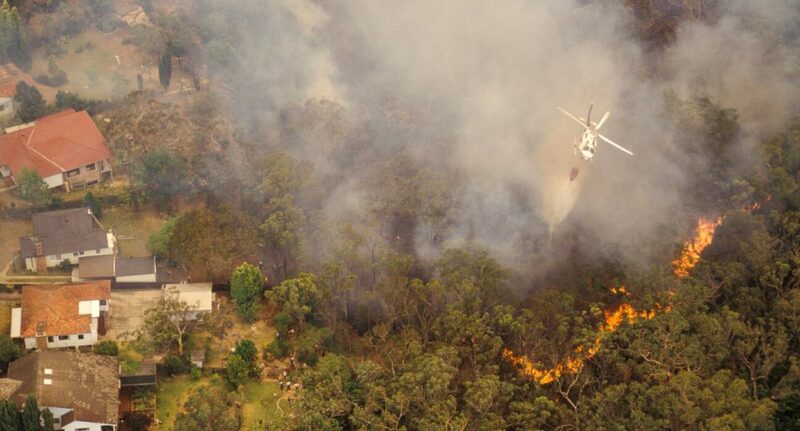 For more information on preparing for a bushfire view the NSW Rural Fire Service guide. About 90% of bushfires are a direct result of human action (either deliberate or otherwise)2 ; an estimated 50 percent of bushfires are the result of arson3. Those who live in high-danger areas should remain vigilant, and report any suspicious activity to local authorities. It goes without saying that you should always take care when dealing with potential fire hazards, such as cigarettes and campfires. Gather all the required information, including your policy number and the details of the incident. Lodge your claim online or over the phone 24 hours a day, 7 days a week. Leave it with us; we’ll get back to you within 2 business days.